High rate of attrition in Indian organizations has been an issue that has been viewed and interpreted from different point of views by people depending on which side of the table they are, as well as the industry to which they refer. Being in the profession of human resources one of the common and major challenges that we face is employee retention to counter the high rate of employee turnover. My professional Guru Mr. N C Sharmawho has over 40 years of experience in Hospitality and stints in other industries such as Construction, Engineering, textile & Education in the field of Human Resources has a unique point of view about his experience with high rate of employee attrition in India as well as other countries. In this article you all will get to know his views about the reasons for high employee turnover rate in Indian Organizations. In my over 40 years of work experience majorly in Hospitality as well as stints in Construction, Engineering, Textile & Education industry, I have looked at this issue (higher turnover) from a different point of view and would like to refrain from the traditional reasons put up in most presentations related to this subject top reasons for high employee attrition rate in India. In the first place I have felt that the preliminary reasons for attrition need to be first known before we get into the other generic reasons for attrition. The first reason that comes to my mind is in relation to the Unskilled, Semiskilled or Skilled category to which the employees belong. The supply and demand of the relevant skills required in different industries account for the major causes of attrition or lack of attrition. The other reason that comes to my mind is the location and aggregation of the industry. It has been my observation that in an area where a relatively large concentration of the similar kind of industries is there the attrition in all the categories whether Unskilled, Semiskilled or Skilled is relatively higher than in a area where industries are scantily located. The job opportunity in the vicinity of the industry / work place to the home town of employees contributes to the third reason for attrition. I have numerous instances where an employee earning a fairly higher salary in a Metro city would be willing to go to a similar industry near to his home town for a relatively lower salary. The next dimension worth considering is the need for the job. I have come across numerous cases where the need for the job amongst employees depends on the financial back ground to which they belong specially in the unskilled and Semi skilled category. In the skilled category the need for job is determined by the frame of mind of the employee. There have been fresher’s who have apprehension to do manual work even if it may be at the initial stage of their career. The family back ground in terms of financial position, family background egos, upbringing, dignity for labor, caste & religious belief has a lot to do with the stability and sense of satisfaction of the employee unless the need to keep the job is dominant for other pressing personal reasons and families financial position. Yet another dimension that is responsible for the attrition is the wide gap between the learning imparted in the institutes and the reality at theactual work place. The rapid commercialization of the education industry has a large bearing on attrition due to the glamour that they sell at the time of enrolling students in their institutes. The rapid mushrooming and commercialization of educational institutes is also responsible for the decline in talent and practical know how that is expected from employees who enter work place situations. Having addressed to these back ground salient features that exist behind attrition the core reasons cannot be ignored, as in a changing economy from dominantly agricultural to manufacturing and now to service industry booming the work place also has a mirror to look into for the causes of attrition. A bit of insight into the candidate back ground at the time of recruitment could help in selecting the right kind of candidate keeping in view the industry specific requirements. A candidates high ego and family pride may not be the right candidate for a hospitality industry and similarly a candidate with lack of mental mathematical talent or written / verbal communication may not be suitable for a position of responsibility. An in-depth profiling of the candidate thus needs to be acquired matching to industry requirement before the selection is decided. Some organizations over-sell the work place prospects in terms of career growth and remuneration prospects at the time of induction which again becomes a vital reason for attrition. The lack of clarity of salary to be drawn by way of quoting Cost to Companyas the salary to prospective candidates is a cause ofconfusion and hence resentment for quite many employees. Unfortunately we use quite many terms for salary drawn like Cost to Company, Gross Salary, Net salary and In-hand Salary or even net Salary after Tax Deductions. Apart from this the ambiguity in annual benefits such as Bonus, LTA & Leave entitlement / En-cashment which are different in different organizations due to which the candidate feels cheated for no fault of the organization. Lack of existence or clarity and application of policies and rules by which the employee is governed leads to deterioration of organizational culture which in turn becomes the covert reason for resentment that keeps brewing and ticking in the employees mind till a stage where the explosive decision to quit is taken. Due to lack of a proper well defined organizational culture the organizations are subjected to different approaches of dealing with employees that suit to the supervisory staff and managers leading to biased and unfair treatment. Almost all appraisal systems are redundant as the element of subjectivity cannot be removed in order to arrive at a true evaluation of the employees performance and productivity. As a result the efficient & deserving but neglected employees prefer to leave, leaving behind the ones that are mediocre and managing the bosses well to cover-up for their inefficiency. Unfortunately we do not have a system whereby the well defined Fair Wage & Living wage parameters are implemented at the ground level. Most wages are determined by way of the gravity of need that the employment seeker has and not by a uniform policy at the organization level, as a result on the flip side the standards of operations and production that the industry requires suffer. As there is a gap between skills that are required at the industry level and what is produced at the institute level we see that on one hand there is unemployment and on the other there is lack of talent. At the senior level in almost all organizations there exists the Abilene Paradox due to which the efficient executives with self respect prefer to venture into entrepreneurship of their own rather than being part of decisions that are not agreeable to them or are forced on them. 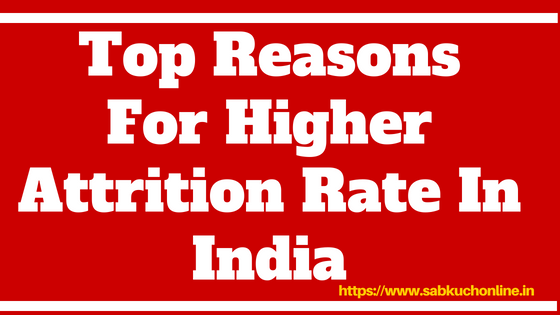 Let us know about this article Top Reasons For Higher Employee Attrition Rate In India and please comment your views and thoughts too. Also please do visit our youtube channel and subscribe our channel Sab Kuch Online for more informative video.